Mommy: Does my hair smell? Cookie: Mommy, did you take a shower last night? Mommy: No, I was too tired. Cookie: Your hair stinks. Go take a shower after breakfast. Me: Making breakfast must have messed up your hair. Poetry Challenge (7th Grade English Terrors All Over AGAIN). So I received this challenge from Blunderdad (how do grown men get roped into these things? Oh right. Dads.) to write a ten line poem with the “love” in each line and only four words per line, the “Love in ten sentences” Challenge. The last time I wrote a poem was … seven grade English class? Having to stand up and read the abominable thing was a nightmare. Publishing this one on the internets? Well, at least my fly isn’t down this time. Signs of terrible poetry? Stretching the rules of challenges and literary decency. At least I’m not trying to rhyme “collagen” with “apologin” (or name you a direction, Cookie). I think there’s part of this process where I’m supposed to nominate others to share my pain in trying to compose bad poetry, in the spirit of those fun 90’s emails that promised me that Bill Gates would personally give me a jet and ten million dollars if I forwarded the thing to ten people. I’m not going to nominate anyone. You’re welcome. And you’d better be appreciative, too –I’m giving up a private jet and ten million dollars so that you don’t have to relive terrible moments of middle school English class. Halmoni*: Cookie, sit next to me. My soaps are on. Mommy: Mom, its 9:30. It’s way past Cookie’s bedtime. Halmoni: She’s fine. Look, I raised you, and you turned out ok, right? Mommy: But you never, ever let me watch TV when I was growing up. Cookie: Why is everybody crying? Me [stupid jet lag killed the internal dad filter]: She cheated on her husband, who also cheated on her with her sister. Their mom found out and is trying to use it to take over their company, and their dad is dying. I think. I don’t understand Korean. Cookie: What’s cheating? Are they not playing by the rules? Cookie: It’s silly to get so upset about something so small. Me: That’s the point of Korean dramas. You can tell by all the serious music. ** Candyland, not poker. I’m not that advanced (must teach probability before teaching poker) irresponsible of a parent. Looking at the Brooklyn Bridge or Fraunces Tavern, it’s easy to forget just how young America is compared to the rest of the world. Yet, places like Jonyesa were already half a millennia old (the current iteration of the buildings may be newer) when the Brooklyn Bridge was new. 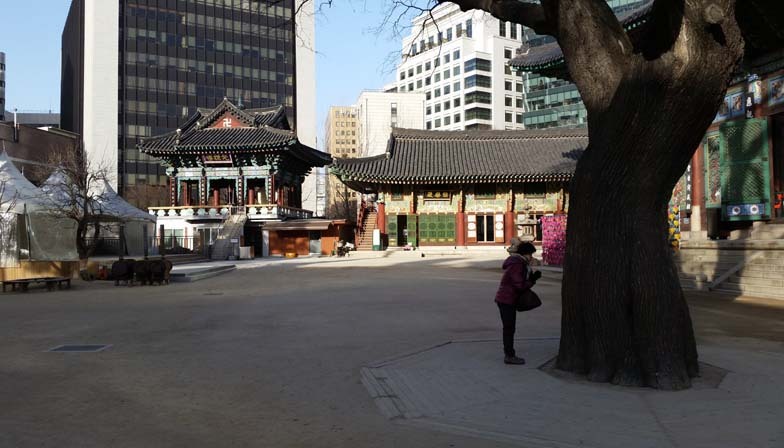 It’s an ancient, but still functioning temple surrounded by high rises in the middle of a cramped and modern city. Like many Buddhist temples, there’s a large gate, though here, a third is blocked by a concrete building. 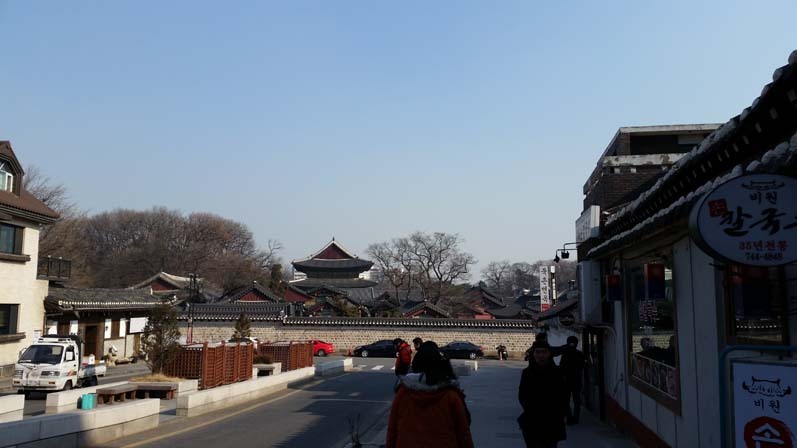 Walking over to the main temple, there are two trees believed to be four to five hundred years old. Apparently, it’s custom to venerate them. The main temple itself is a thing of beauty. 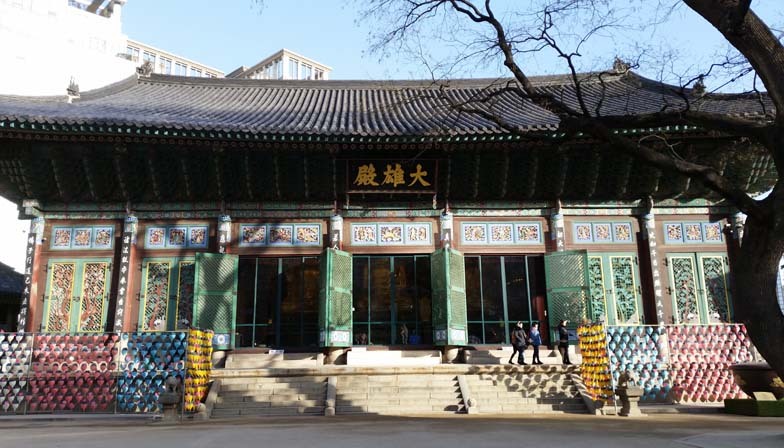 The colorful roofing and the painted panels showing the scenes from Buddha’s life enclose three gargantuan statues of Buddha and thousands of smaller statues. We’re not Buddhists, Cookie, and, since this is someone else’s place of worship, Mommy and I stayed outside. Halmoni*, a devout (never misses mass on Sunday, and occasionally goes every day) Catholic, still feels the need (her grandparents were Buddhists) to bow in front of the statues whenever she visits a temple. You, of course, went with in her. As Mommy and I walked around the outside looking at the exquisite decoration, three things became readily apparent. One, each temple has a gong by the door, which sounds the beginning and end of meditation times. Two, gongs are very tempting to three-year olds. Three, Halmoni isn’t as fast as she used to be. Fortunately, many of the people inside apparently had found inner peace, and the loud gong (and your even louder giggling) was merely met by smiles as we bundled you back outside. The bell tower, properly roped off from inquisitive three-year olds. Cookie: May I invite Isla over for a playdate? Cookie: Are you sure our place is clean enough? 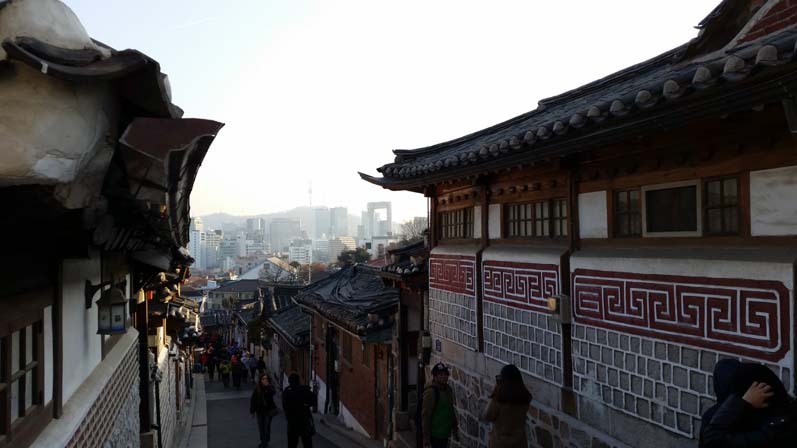 Compared to New York’s subway system, Seoul’s is modern, clean, and convenient. The train tracks are walled off, with doors that coincide with the subway car doors to prevent people from falling onto the tracks. Each of the doors are numbered by car number and door number (door 4-3 is the third door of the fourth car) allowing people to arrange meet-ups in the station itself (cell coverage and wifi are available underground). Station announcements tell you when the next train is coming. Train announcements tell you the next station in Korean, English, and Chinese. Major stations have bathrooms. More surprisingly, the bathrooms are clean. As a consequence, the elevators are not only quick, they don’t smell of pee. In short the Seoul subway system is everything you’d expect in a modern subway, so what’s the warning? Ajumma* #1: Why do you have a stoller? Six** is too old for a stroller. Ajumma #2: She’s very tall for three! Mommy: It’s for the jet lag. Ajumma # 1: That makes sense. Cookie: Yeah, we flew from America. It was a loooooooong flight. Ajumma #7: So she speaks English as well as Korean? 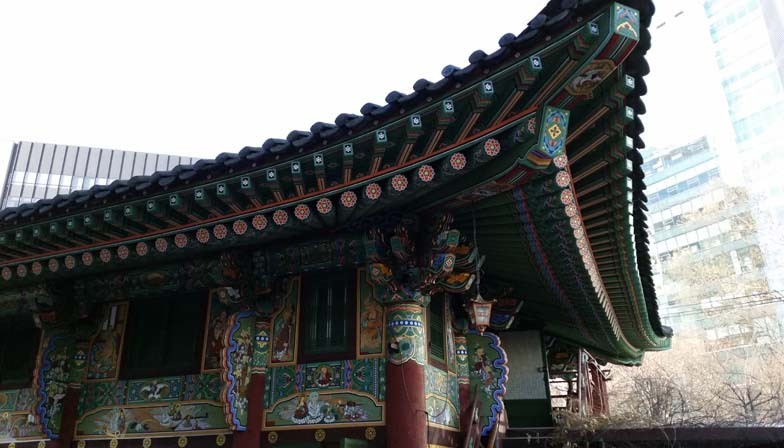 Oddly enough, the scrutiny and your language skills met the approvals of the Ajumma Inquisitors****, and soon, each Ajumma started rummaging through their purse for something to give you. Every subway ride, Cookie, you ended up with assorted candy, cookies, pocket lint, and in one case, a muffin. I was emphatic about not accepting any of this, as, well, you’re literally taking candy from strangers, but Mommy explained that it’s customary for people to give things to cute kids and very impolite to refuse (after refusing the first time a gift is offered), especially since we just passed inspection. Of course, we didn’t let you actually eat any of the sweets you received, but yeah, I hope the lectures on how you weren’t supposed to accept candy from strangers stuck (after we allowed you to take candy just one more time). Prepare for inspection. You’ve been warned. ** In traditional Korean numbering for age, newborns are counted as 1 year old the day they’re born. You’re not that tall, Cookie. *** “nnnn” is a Korean sound for “Yes,” though I think Ajumma #3 may have been constipated as well. **** I think this explains the cleanliness of the subway system and Seoul in general. 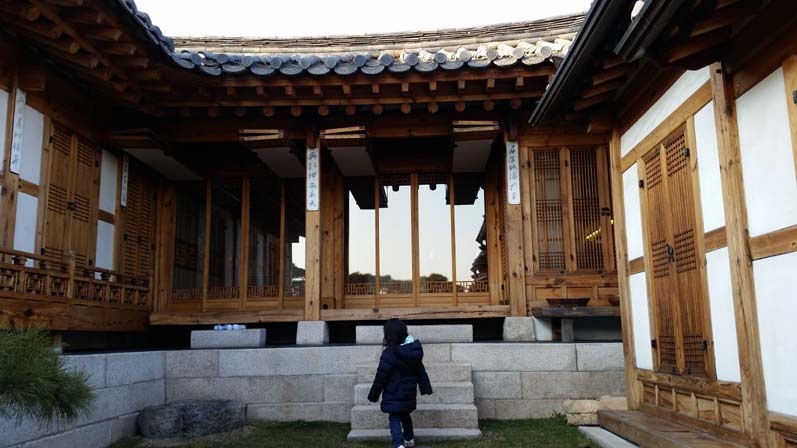 If the Ajumma Inquisitors are going to pass judgement on every toddler and stroller they see, they’re certainly going to do something about litterbugs and trash. 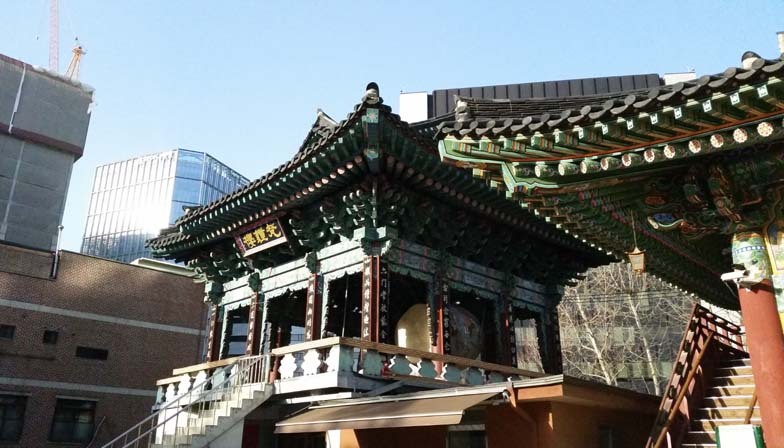 Seoul is a city of contrasts, with historic buildings next to modern ones, all surrounded by buildings that building techniques that are just ancient. 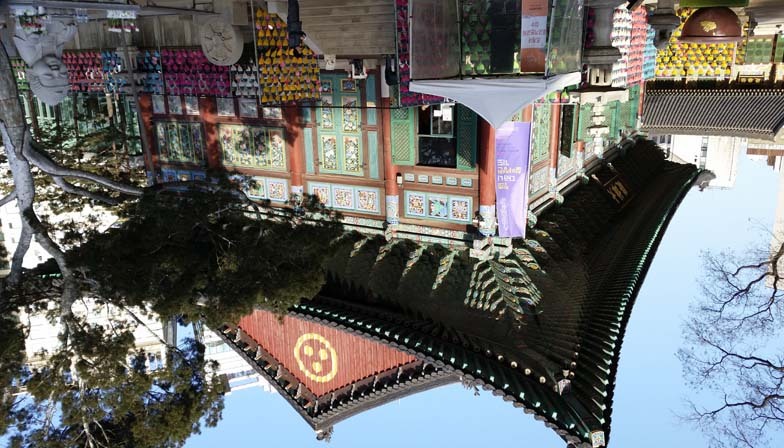 Halmoni’s plan was to take us to Bukchon Hanok Village, a section of Seoul not far from Changdeokgung Palace where the houses (hanoks) were preserved to reflect the feel of the Joseon Dynasty. Stepping into that little alley feels like steeping back into history. 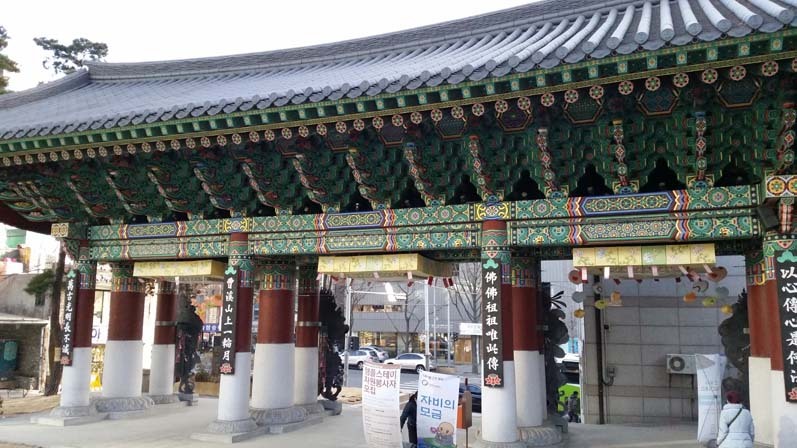 It’s spectacular, except, as we made our trek from the palace, we passed countless hanoks preserved and being used as homes and restaurants. 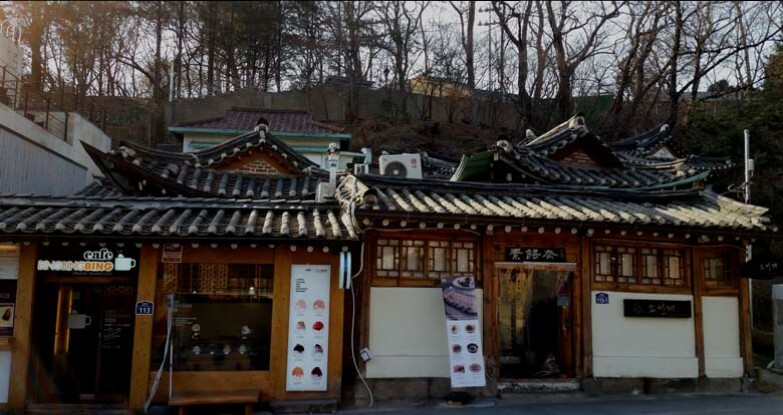 The first stop was a mandoo restaurant (serving only mandoo and mandoo guk, of course) a stones throw from the palace walls. 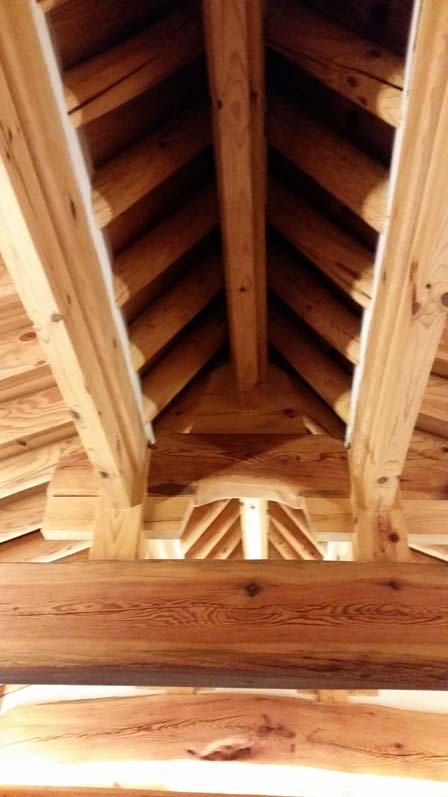 While the dumplings were excellent, I think I spent the entire lunch staring at the plaster and log ceiling and other construction bits of the building. Many other houses, restaurants, and shops along the way held the same charm. 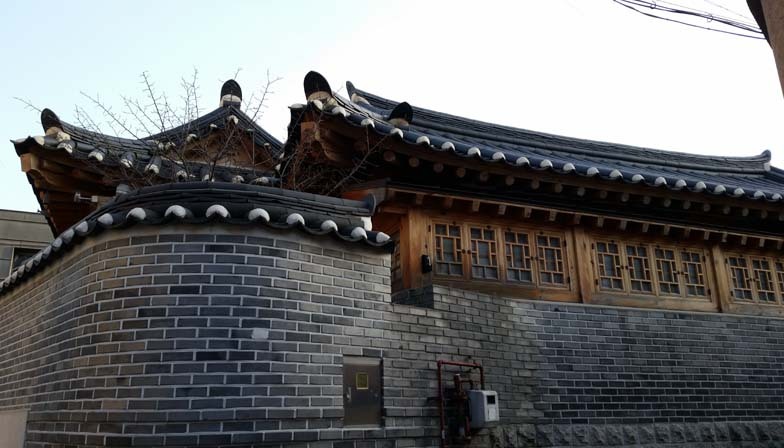 The street famously photographed in Bukchon Hanok Village is located along the side of a hill, allowing a stark contrast between modernity and tradition, with the ancient hanoks backed by the glass and steel skyscrapers. As a New Yorker, I felt sympathy for the residents, with flocks of tourists outside, until we were invited inside of one of the hanoks (for a fee) by a tour guide for tea –the residents were spending winter in Peru. Inside, the traditional building techniques were supplemented by modern fixtures for a unique blend of tradition without sacrificing the comforts of the 21st century (not pictured, the marble and stainless steel kitchen and the tiled bathroom). 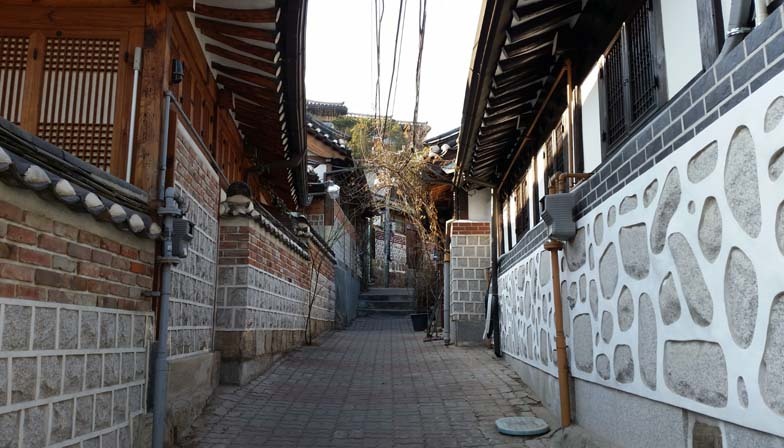 Aside from the tourists, walking around Bukchon is like walking back in time. A little imagination to remove the utility meters and the power lines, and the quiet streets and ancient architecture suddenly come alive. 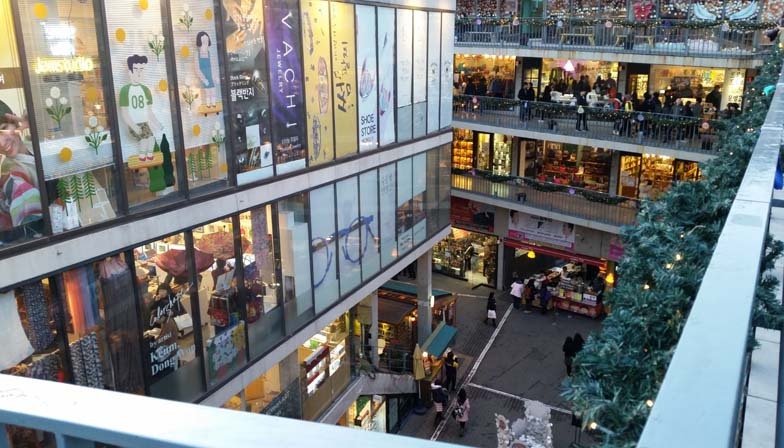 Walk a few blocks away, of course, and you reach Insadong, with places like the Ssamzie Mall (one continuous row of shops spiraling around an open air courtyard), full of the bustling energy of youth, selling the latest (and cutesy) trinkets and technology. 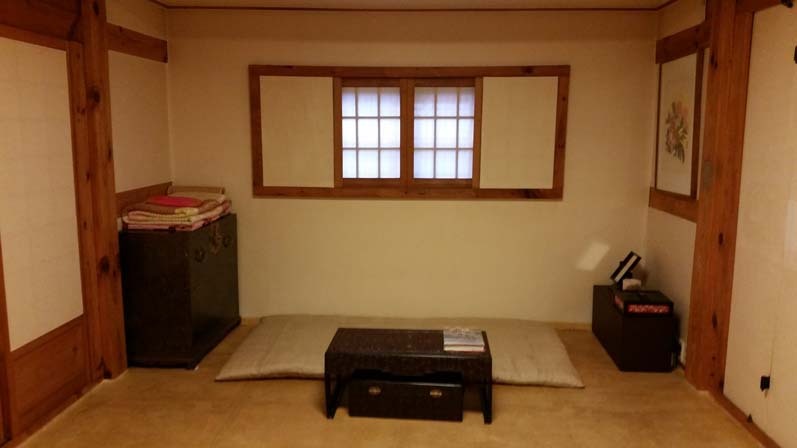 We’ll have to do this part of the trip again, Cookie, since you slept through everything except the hanok tour after lunch.